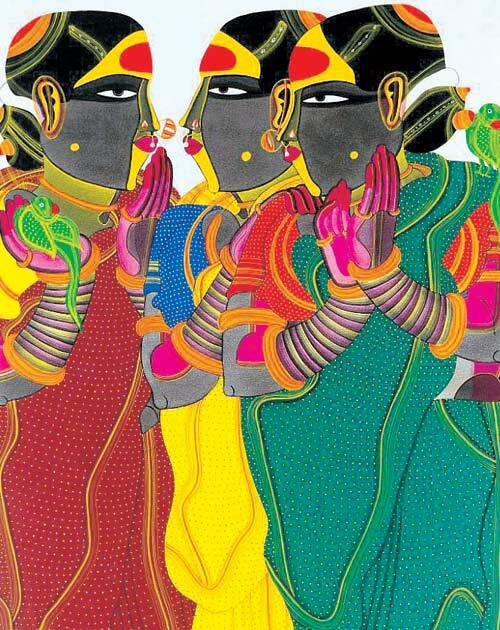 The vivid colours of Telengana – including turmeric and kumkum on the forehead – in Thota Vaikuntam‘s paintings. Shyam Benegal makes use of the same colour palette in films like Ankur and Nishant. This entry was posted in Art, Culture, Hinduism, Indian Women, Paintings, Rural, Sari, Sari Blouse, Women and tagged Colours, Hindu Women, india, rural india, saree blouse, sarees, South India, Telengana, Thota Vaikuntam. Bookmark the permalink. So vibrant! Brings to life the phrase “pasupukumkumam” (haldi-kumkum in Telugu).